"Logan Langley is just months away from his thirteenth birthday and the biggest day of his life- the day he will finally be Marked. The Mark lets people get jobs, vote, and even go out to eat or buy concert tickets. And then he finds the wire." 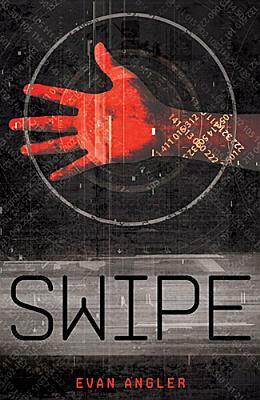 Swipe is a story about a future world, in where everyone has to be Marked to survive. To have jobs, to eat, to go to school - you have to be Marked. Logan Langley is paranoid. He thinks he is being watched. His parents and all the doctors he's seen don't believe him. Along comes new girl Erin. She's pretty and doesn't pay much attention to Logan, until he tells her his story about how his sister's Marking procedure went wrong and she never came back. From this moment, Logan and Erin are swept into adventure and espionage. Evan Angler has done an amazing job setting out this world and his characters for us. Logan is might be paranoid and possibly crazy, but he is sweet and sensitive too. Erin is a wild card, constantly pushing the boundaries and showing her courage. All the other characters have their own little quirks which makes them all lovable. As I followed Logan and Erin on their journey, I constantly speculated how the story would end. Would they find the bad guy? Will Logan be saved? But what I did not expect was the massive twist at the end of the story. Actually, make that plural, twists. So many things you thought you had figured out, well, you haven't! Swipe is a bold new story, taking Dystopian to a whole new level. I thoroughly enjoyed it and can't wait for the sequel to be released. Snag yourself a copy of Swipe now and join the craze! For those of you who have already read and loved Swipe, the second book in the series, Sneak, is set for release on September 4, and is available for pre-order now! Or if you haven't read Swipe, then just order them both together, it will be worth it! Now for the part you have all been waiting for - the giveaway! A paperback copy of Swipe is being given away, all you have to do is enter in the Rafflecopter below! US/CA only!